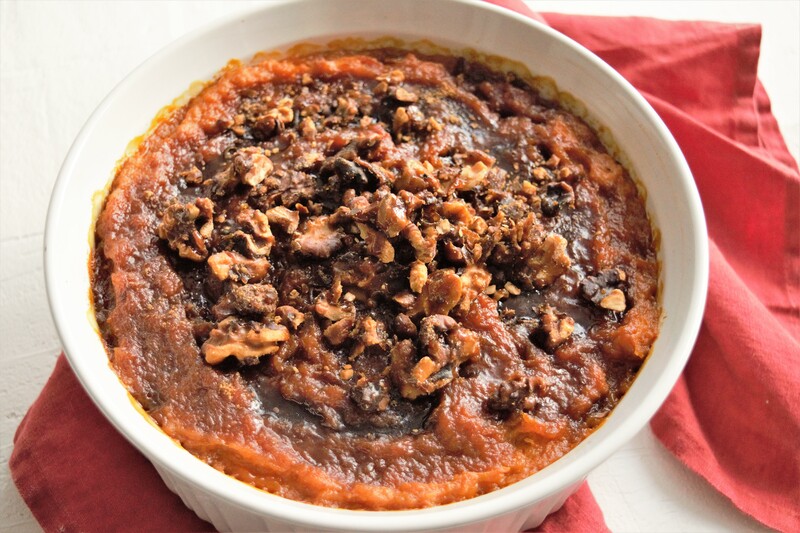 Another Thanksgiving classic is this vegan spicy baked sweet potatoes. It is tasty, fragrant, spicy and sweet, and it will surprise all your guests. The combination of coconut milk and Thai curry paste is divine! This unexpected and fantastic blend of flavors will delight your table from Thanksgiving until Spring. 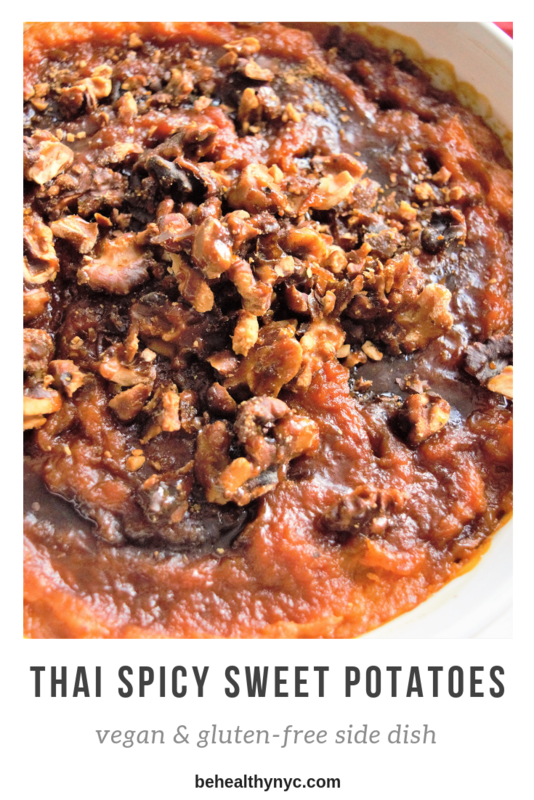 The candied walnuts are optional, though they add a nice contrast and extra sweetness. 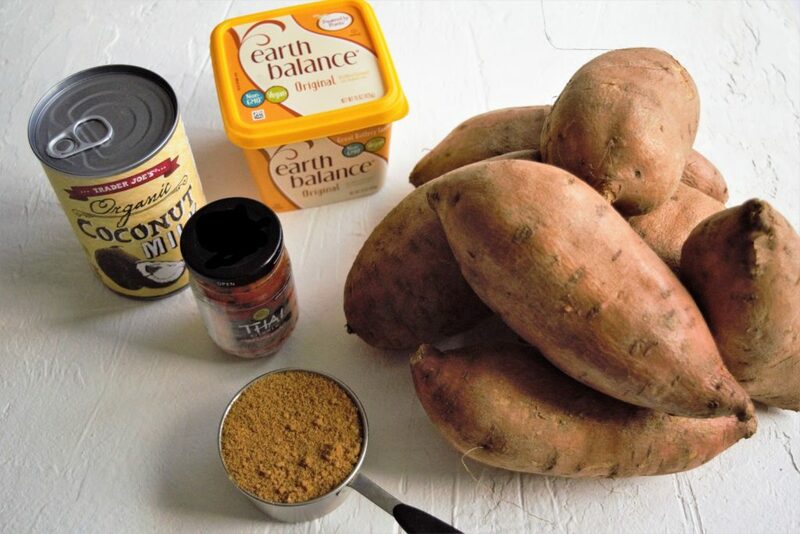 You will need about 7 medium sweet potatoes. Wash them well with a vegetable brush. 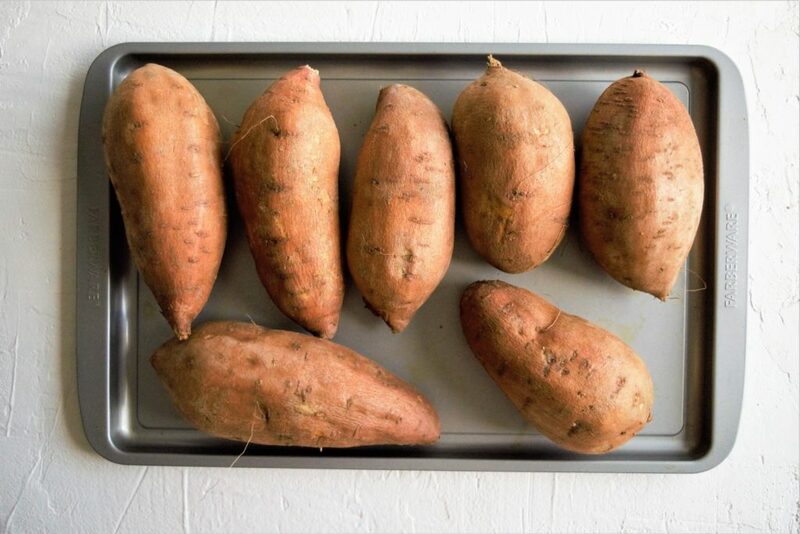 Using a fork or a paring knife, poke a few holes on each sweet potato. This way the steam will come out and they won’t explode, making a mess inside your oven. Heat oven to 375 degrees. Bake potatoes on a sheet pan until very soft, about 75 minutes. When cool enough to handle, peel and mash. 1. Heat oven to 375 degrees. Bake potatoes on a sheet pan until very soft, about 75 minutes. When cool enough to handle, peel and mash. 2. In a small saucepan, heat coconut milk with curry paste over low heat. Mix coconut milk mixture, half the sugar, half the butter and salt into potatoes. Keep warm until ready to serve, or cover and refrigerate up to two days. 3. At least 30 minutes before serving, heat oven to 425 degrees. 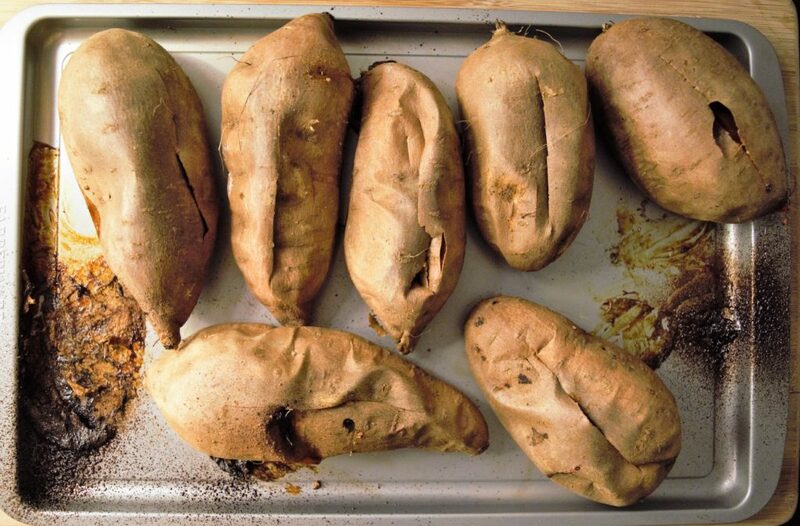 Put potatoes in a baking dish, cover with foil and bake 20 minutes. Uncover, dot with remaining vegan butter, sugar, and cayenne pepper, and broil until brown and crusty, checking often to prevent scorching. This recipe looks delicious. But, I may have to leave off the cayenne as my husband is not big on spice! I could do have spicy, half without. Yes! That’s a good idea! I think just the Thai curry paste is enough heat.